We are pleased to announce the introduction of a new Assistant worker for Cornwall. Alice is funded by the Cornwall Community Foundation. Seen here alongside her team co-ordinator Debbie, outside the law courts. Welcome to the team Alice! 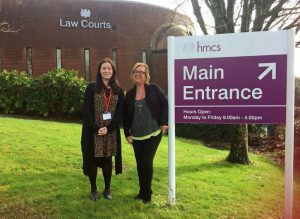 We are delighted to offer a collaborative approach to developing volunteer opportunities with Harbour Drug and Alcohol Services, in Plymouth, via a new role to be shared across both organisations. This part time (22.5 hours per week) position is joint funded; initially for 12 months – there is potential for this role to become permanent.